The anti-cop mob blew a gasket after Cardinals’ mascot ‘Fredbird’ was pictured holding up a sign supporting police lives. The picture was taken during a Cardinals at Busch Stadium and was later posted on the St. Louis Police Officers Association Facebook page. The Cardinals asked the police officers association to take down the picture from their Facebook page. Days after a sports blog posted a story about Fredbird holding up a ‘Police Lives Matter’ sign, the St. Louis Cardinals have responded to the controversy. According to Tom Ley of Deadspin, a fan took the picture of Fredbird at a local police event, although the exact time and location of the photo could not be verified. 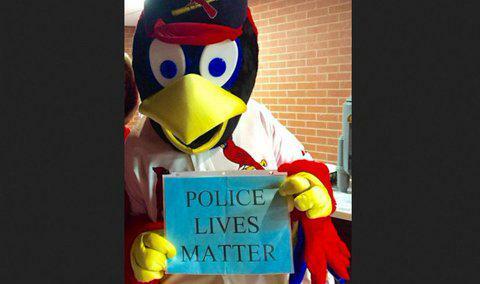 Ley sought comment from the Cardinals to understand why the team mascot would visit a police event and hold such a sign. A Cardinals employee responded that Fredbird is available for all kinds of events and special appearances, and all someone has to do is fill out an application. Fox 2 News also sent an email to Team Fredbird asking for comment, but the station did not hear back from the group. However, the St. Louis Post-Dispatch reported Friday that Deadspin was incorrect in its claim the picture was taken at a police event. A Cardinals spokesman said the picture was taken at Busch Stadium on Sunday, May 17. A man and woman approached Fredbird and asked for a quick picture. The woman handed Fredbird the sign, which he held up for the photo. Fredbird was unaware of what was on the sign, the team spokesman said. The photo–with the woman cropped out–appeared on the St. Louis Police Officers Association Facebook page on Monday. The Cardinals contacted the group on Tuesday and asked them to remove the image, and the organization complied with the request.